Snow didn’t stop them in 1963! With the news that this year’s British cyclo-cross national championship has been postponed due to snow and ice, we thought we’d delve into the Cycling Weekly archives to see what happened to the same event in 1963. Why 1963? That year Britain was gripped by ‘The Great Freeze’, a sustained cold period that stretched from Christmas 1962 and into the following March. The River Thames froze over in London – always that historical marker of how much ‘colder it was in the old days’. There were thick snowfalls all over the country, which promptly solidifed into ice as the mercury stubbornly refused to rise up the nation’s thermometers. None of which stopped Britain’s finest cyclo-cross racers from turning up at Harlow to don uncomfortably short shorts and take part in the race. It didn’t stop the crowds turning out either, the photos accompanying the report show a large number of spectators watching the event. Mick Stallard – son of 1934 world champion Percy Stallard – took the honours in the snow-bound course, and netted himself the princely sum of £20 in the process. The 2010 cyclo-cross championship is now scheduled to take place at Sutton Park, Birmingham, on February 6-7. 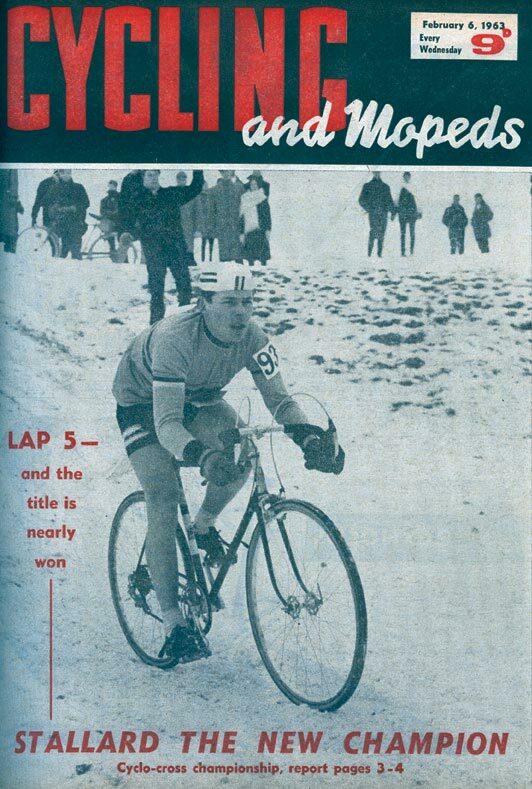 You can read more about the 1963 cyclo-cross championships in next week’s issue of Cycling Weekly magazine.